Are you a victim of Murphy’s Law? If something can go wrong in your life, then it will. With that said, you need to be prepared when it inevitably does especially as I hear dozens of agents vent about their unluckiness every day. Truth be told, these agents aren’t unlucky - it's part of the job. Preventing accidents can be difficult, so being prepared with a “real estate emergency car kit” is the best way to combat the effects of Murphy’s Law! Your emergency should hold all your tools to fight Murphy’s Law. Focusing on repairing, cleaning, and stocking up will help combat most of your bad luck. Remember that saying, “It’s better to have it and not need it, then need it and not have it”? Well, below is a list of life savers to keep in your emergency car kit for when Murphy's Law inevitably strikes again. Have you ever spilled a drink on yourself? Or accidentally stained your shirt while preparing for an open house? How about tearing a hole in your blouse because it got caught on a nail? The real estate life is a messy one, no matter how careful you are. Keep an extra outfit in a duffel bag in your trunk for when life gets messy. Is your phone dying? Don't worry, a power bank is the perfect accessory to keep in your car for that extra boost when your phone is on the verge of dying. Never miss out on a new client because your phone is dead. Have you ever hosted an open house, only to discover some dirty mark on the hardwood floor, or a mark on the wall? Packing cleaning products will help you tidy up messes as they happen. If your client brings their dog along, they might also consider them their furry child. Keeping dog treats in your emergency car kit will show you go the extra mile to connect with your client. Small gestures go a long way and can help build trust with your clients. You can’t show a room in a dark house! Well, maybe you can but you shouldn’t. Pack some light bulbs in your emergency car kit for when the lights go out or break. How embarrassing is it when you don’t have a business card on you? Make sure that never happens again by keeping a box of business cards in your emergency car kit. You never know when you’ll meet a potential client or get permission to leave your business cards at a business. It’s best to keep more than enough with you because opportunities are everywhere. If your client has some “loose screws”, then their home probably does too. Be prepared to make minor repairs and touch ups. Pack a tape measure, screw drivers, a hammer, pliers, a wrench, duct tape, etc. Your attention to detail with home fixtures can make or break your deal. You should always have a first aid kit in your car. You never know when you’ll catch a splinter in your finger, slice your finger on a contract, or hit your head on a cabinet. Be prepared to patch yourself or your client up if someone gets hurt. You should also have a flashlight in your car as well. Your car can breakdown at night, you might have to checkout a crawl space, or peak your head into an attic. Yes, most smartphones have flashlights built into them, but you’ll want to save your phone’s battery in case of a real emergency. Showing a smelly house isn’t only a poor experience for your client, but it’s also a poor experience for you. Packing some air fresheners or scented candles can help cover up annoying smells that will deter any buyer. 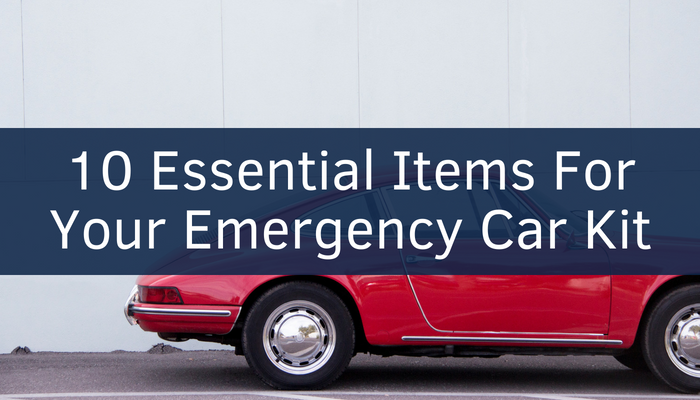 With a real estate emergency car kit, you'll be prepared when the inevitable accident occurs. Instead of thinking, "Why am I so unlucky? Why does this always happen to me? ", you'll think, "I'm lucky I packed an extra shirt!"